The 2000 dove season, opening September 1, appears to offer some of the best dove hunting in many years. Based upon spring coo calls counts conducted by California Department of Fish and Game (DFG) biologists and others, and spring weather conditions, the fall flight of doves is expected to be much greater than in recent years. Mourning doves are the most abundant dove in North America and are the most widely hunted and harvested game bird. Several of the state wildlife areas have been using Upland Game Bird Stamp funds to plant safflower and sunflower to improve dove habitat and hunting. Dove populations in the West have been stable in recent years, but remain lower over the long term. Hunting at the following state wildlife areas is a good bet: Feather River, Spenceville, Gray Lodge, Oroville, Little Dry Creek and Howard Slough. Several other wildlife areas offer dove hunting as well. Hunters should note that the popular Butte Slough Wildlife Area, west of the Sutter Buttes, will be closed to hunting due to loss of the lease for the property. 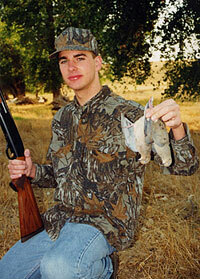 Dove season extends from Friday, September 1 to 15, 2000, with a second season from November 11 to December 25, 2000. The legal shoot time is one-half hour before sunrise, to sunset. The bag limit is 10 doves per day, 20 in possession.